My dad and his mates played a drum roll on the table. Pete paused and looked down at the piece of paper in his hand. But everyone knew who it would be. It was always the same kid. Howooooh! How-how-howooooh! My dad did the awful wolf howl that he always did and I moved a little further into the darkness. My mum laughed a little next to him but I could tell she was embarrassed too. Even my brother looked a little awkward as he made his way up to collect his award. His teammates patted him on the back and cheered his name as he passed. I was proud of him too, don’t get me wrong. Paddy is a brilliant footballer, but it’s hard to be a brilliant footballer’s younger brother. I hated going to these presentation nights but I’m not the kind of kid who makes trouble. If I’d asked my parents to get a babysitter, it would have looked a lot like jealousy. Which it was, I suppose. I never won anything at my presentation nights for Fortvale FC. ‘Ripley Rejects’ was what most people called us and I was probably the worst of them. As Paddy sat back down, Dad put his arms around his shoulders in a clumsy hug. ‘Great work, son!’ he bellowed in his ear. Unless Paddy’s game was cancelled, Dad never came to watch me. I’m not saying that so that you pity me; that’s just how it was. Sometimes he didn’t even ask about the score in my match when we got home. He would sit in his chair by the TV and grunt a hello, as if I’d just gone out to the shop for a minute. It was Mum who took me to matches and cheered me on from the touchline. Poor Mum. It was Charlie, Paul’s younger brother. Paul was Ripley’s second best player but Charlie was smarter than me. He didn’t even try to play football; he did break-dancing instead and he was really good at it. He was a nice kid but I didn’t really feel like talking. I nodded and hoped that might be it. A talent makes everything alright, even your brother’s presentation nights. Charlie went over to his parents to ask for another Coke. I’d already had two and my stomach felt all fizzy. As Paddy had his picture taken with the guest of honour, local football hero Trevor Thorne, I went outside to get some fresh air. Unless Mum got her way, which she rarely did, I still had a few hours to wait before I could go home. In the carpark, I sat on the wall and thought about things. I think this was my biggest problem – thinking too much. Paddy never seemed to think about anything, except scoring lots of goals. He never had doubts or worries like I did. What if I gave away a penalty? What if I just couldn’t tackle anyone? What if the whole of my team told me I was rubbish and asked me to leave? These were all sensible fears but they really didn’t help me. It had been a really bad season with lots of heavy defeats. If I wrote a story about 2003-04, the picture on the cover would be me sat in the mud and rain, my head in my hands, as the other team celebrated another goal. Perhaps one of my teammates in the background would be shouting at me for making a mistake. The title would be in big, bold capital letters like a newspaper headline: ‘HOW MANY TIMES?’ And not even my family would buy it. When I started playing football, I gave myself a rating for each game like they did in Match magazine. I wrote them down in a notebook but when the ratings dropped week after week, I just gave up. I would only allow whole numbers and I couldn’t face giving myself ‘0’. There was nowhere to go after that, except minus figures. But then perhaps that was correct; by playing, I was making the team worse. After a little while, Mum came looking for me. She gave me her smile of sympathy and sat down next to me. I don’t think she was having a good time either. She deserved a daughter. She said it like it was a really good thing but I wasn’t sure. Very few people were famous for just being really good people. You needed to be good at something. I didn’t want to become a saint or a monk. I waited for her to say ‘No, you’re great, keep going’ but she didn’t. She didn’t look surprised at all. Mum stayed quiet. It wasn’t the first time that I had talked about retiring. ‘Unlucky kiddo,’ Dad said, ruffling my hair without taking his eyes off the road. He hadn’t had much practice at this side of things with Paddy. I’d just finished my trial for Ripley Rovers and it had been a disaster. A total disaster. ‘Paddy’s brother’ was like a weight around my neck, dragging me down. I couldn’t jump for headers and I couldn’t chase the fast wingers. I kept trying to shake my legs into life but it felt like that time we’d practised swimming with our clothes on. Halfway through, my Dad walked off to watch another match. He’d had enough and so had I.
I shook his hand away and shot him my best evils. I didn’t want his sympathy; I wanted his optimism. ‘Bobby, I’m not sure football’s for you but I think badminton might be your sport’, or ‘Billy, forget about football. You belong on the stage!’ Something like that. Even the suggestion that we went for ice cream would have helped. Instead, we drove home in silence. I wanted to cry but not in front of Dad. Mum was a little better but her smile looked like hard work. It was like a warm-up stretch that you really didn’t want to do. I could tell that she didn’t know what to say. ‘Football isn’t everything, love,’ she started but then she stopped. I could tell she was thinking because her mouth twitched from left to right. ‘There are loads of other fun things that you can try, Bobby.’ Then she looked at me to see if I liked this idea. Right then, as I sat on my bed in my dirty, smelly football kit, I didn’t. The idea of ‘trying’ anything seemed stupid. I gave her my best scowl. I was seven. 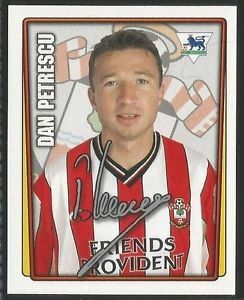 Grandad retired from his fabric shop at 70, Dad wanted to retire from the bank at 65, the Southampton right-back Dan Petrescu retired at the age of 34. I couldn’t retire at seven. I recognised a few of the boys from the Ripley trials but most of them were new. The range of quality was incredible, like the clothes stall at the church fair. It was a real lucky dip. There were the no-hopers like me, the big kids who couldn’t move but could kick it a mile, the small players with lots of skill, and the quick players with no skill. We had it all. We would be playing in a league two divisions below Ripley Rovers but we would work our way up and beat them! That’s what our new managers told us at the end of the first practice, as they passed around the registration forms. Steve and Chris were a strange pair; one small and square with a big face like Mr Potato Head from Toy Story, and the other tall with a big belly like Baloo from the Jungle Book. When they didn’t talk over each other, they were quite encouraging. At least they were at that stage, before we’d played any matches. Thankfully, no-one was told not to come back – Fortvale FC was a rescue home that wouldn’t turn anyone away. It’s hard to say no to loyalty. It takes guts and it takes a real desire to make it to the top. Luckily, there was no chance of us making it to the top and so I became the first-choice right-back. They even made me captain for the final minutes of a 10-1 defeat. Mum had gone to sit in the car because the weather was bad, so she missed my proudest moment. I’m not sure she really believed me when I told her. That was fair enough. And the left winger was gone, dribbling down the line to put in a cross. And the centre forward was through on goal with just the keeper to beat. No-one asked me to play – I was doing this to myself. I was choosing to do this for ‘fun’. When things got really bad, I’d look at Steve and Chris on the touchline as if to ask, ‘Why am I here? Why don’t you just take me off?’ For some reason, they never did. I think they were hoping one day I’d make the decision for them. If I’d had friends on the team, it might have been different. We would have had fun in those short periods when we weren’t losing really badly. But sadly, I didn’t fit in at all. I liked books and drawing birds (we’ll come back to that later); they liked WWE and farting songs. Football was all that we had in common, and they didn’t even want to share that with me. ‘You look live you’ve lived a thousand years!’ Steve joked once after a really bad defeat, and so Chris nicknamed me ‘Turtle’. I think he meant tortoise but correcting him would have made things so much worse. The name stuck because it was true. I moved slowly and I never looked happy. ‘Turtle’. But you can’t do anything about your face. Mum says that when I was born, I looked like a really old man with all my wrinkles and they thought maybe I had been born backwards. Surprise, surprise, Paddy loves that story. At the end of that first season, I was ready to quit. I didn’t want a transfer to the lower leagues, or a move abroad; I just wanted to retire. Over the summer, I tried playing cricket but I was even worse at that, if that’s possible. In rounders, I ran everyone out with the bases loaded, and I forgot to drop the bat. The pressure of team sports was too much; it gave me headaches. But I wasn’t ready to just be ‘the artistic child’. And so I signed up for another year of hell.